As this topic is of a 'continuing' and 'evolving' nature, I've decided to give it a page all to itself. The content has been transferred from the 'main' page and will continue to be updated as and when more detail comes to hand. As has been mentioned elsewhere here the D78 Stock is long overdue its refurbishment programme to extend its service life. 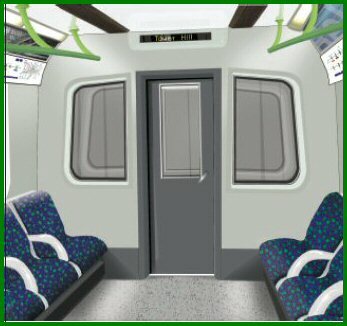 It has been announced that this will be carried out by Bombardier at Ilford. The latest information I have is that the first 3 Car unit will go to the contractors in July so that they can assess the work that is to be done. I understand that the stock will transfer by rail, though I don't know the proposed route it will take! There is an 'old' rail link from Platform 6 at Upminster (from where the Romford service operates) into our depot and I wonder if the intention is to reinstate this to allow a relatively easy transfer process. This - I hasten to add - is complete speculation on my part and I'm sure I'll be proved to be wrong! Well - I said to watch out! It appears that there may have been a 'change of plan' at Bombardier as to where the work will be carried out. It seems that they've suddenly realised that the Ilford works may be a little too small to undertake the work and that they're now considering using Wakefield as they do have 'previous' in terms of doing LU refurbishments - most recently of course the 73TS. The first unit may however go to Derby for initial investigation before the first train is sent to Wakefield. This puzzles me a little - if the work is to be done at Wakefield why not send the first unit there and let the 'on site' team get their hands on it right away? But ours is not to reason why - I'm sure there's a perfectly logical reason for the idea! The latest plan seems to revolve round the D Stocks being transferred from Ealing Common depot to West Ruislip and then the transfer to National Rail can be achieved using the already well used connection there. The first of the D78 Stock units finally departed from Ealing Common Depot (via the Museum Depot) by road on the 27th and 28th August 2003. My suggestion that this would be the case had been rather 'poo pooed', even at quite a 'senior' level so I write this update with a certain smug grin on my face. Whether the first Unit is going straight to Wakefield or not, I don't know - any readers with more detail please let me know! However, I understand that the idea of reinstating the pointwork at Upminster between London Underground and the 'National' rail network is indeed to go ahead - staff will be warned that the 'old' route across the sand drag will no longer be an acceptable shortcut. So whether this will be involved in part of the programme or whether it's just seen as a 'good thing' is unclear. I'm told that the first D78 Stock Unit has indeed made its way to Wakefield where it's undergoing a 'design finalisation' programme. 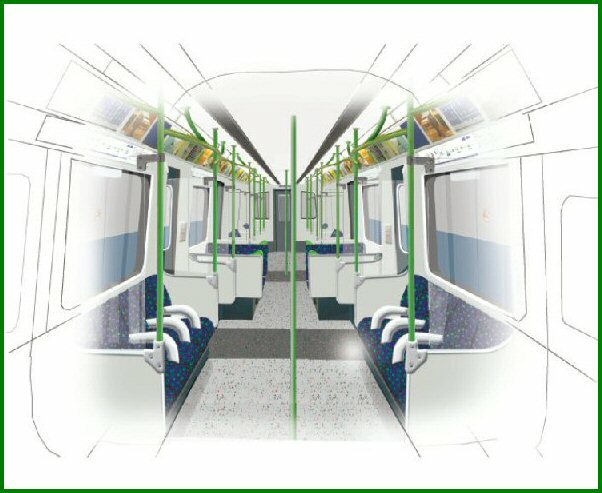 Once this is complete a further Unit will follow so that a complete train can be refurbished. I understand that it is hoped it will be returned to London Underground by the end of May 2004. I've come across a bit of detail concerning the placement of orders for equipment to be used as part of the programme. Details of this can be seen here. I understand that the next three car D Stock is to go north on 17th December 2003 - as far as I'm aware it will depart from Ealing Common Depot by road in a similar way to the first three car unit. I further understand that the contractors are now reviewing the wiring on 7002 at Wakefield to see what can be left and what needs to be replaced. The next unit is now in the process of being transferred to Wakefield for Refurbishment. 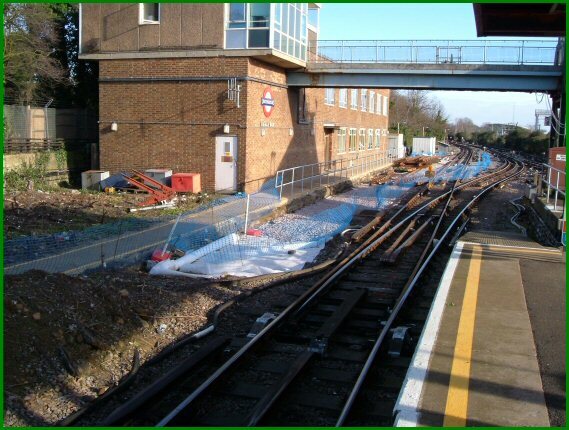 The unit had been at Ealing Common Depot for preparatory work. The plan was that it would form part of a service train and then be stabled at Upminster from last Thursday (11 December 2003) prior to depature. 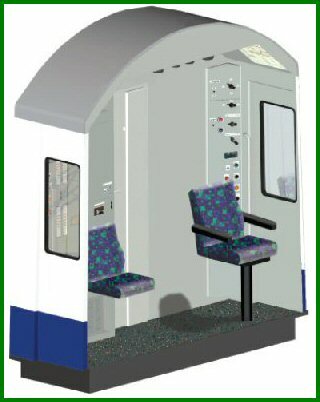 All refurbishment units are, after all, to be moved from Upminster Depot by road. I believe this has been decided as Upminster not only allows easier access to the motorway system, but also the depot itself has more space for the moving of the larger low loaders needed for the undertaking. 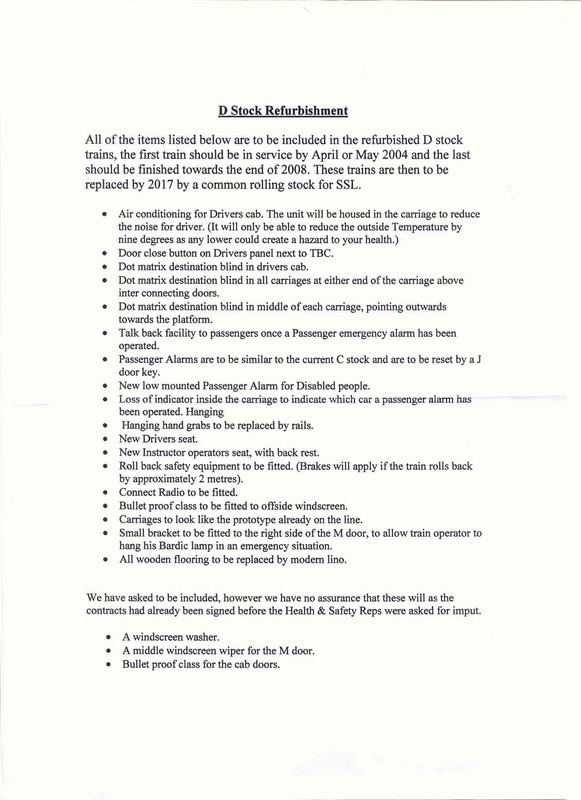 I received confirmation today in the form of an email today which read as follows: 'Dave - just to let you know, the first car of the latest unit for refurb, 7021 had left Upminster depot by last night - the other 2 cars of the unit, 17021 and 8021 were still there, but 17021 was behind the lifting road, so I would guess that it will be going today, and 8021 soon after.' Thanks to SolidBond for that. At long last a 'definitive' list of the works which will be included in the refurbishment programme have been made available, and the content can be read below - if you wish to see the document in full size you can do so by clicking on it. Most of the points are pretty well self-explanatory, but where I think there is any doubt as to what is being outlined I expand below. I'll deal with the points in the order they appear, and are detailed to the best of my knowledge and understanding - I'll use the 'key words' as the point of definition! Any that I don't expand upon are really 'driver only' matters, and won't be readily noticeable to passengers - if you do want more detail though please e-mail me. Air Conditioning Obviously this is intended to improve the conditions for the driver, but it has an application for the safe operation of the train, in that it means that in very hot conditions the cab can be kept at a reasonable temperature without the need for the cab door being kept open, as is often the current practice. 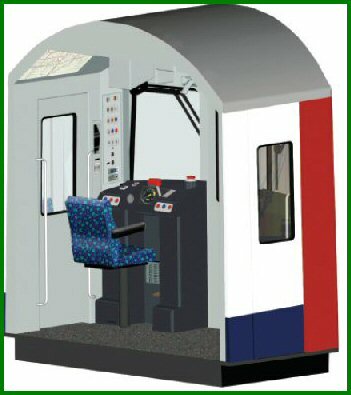 Many of the 'deep tube' stocks already have this feature, so it will be far from unique on London Underground. Door Close Button At the moment the offside doors (i.e. those on the opposite side of the cab from the driver's seat) have to be closed from that side of the cab - there is not a close button on the driver's desk. This will address this issue. Dot Matrix These points will bring the stock into line with the more modern (and some already refurbished) stocks. They are the 'electronic' destination and number boards now commonly seen on the Underground. Passenger Alarm Equipment At the present time the trains are equipped with a 'plunger' type alarm button in the train's cars. The proposal is that the new fitting will - again - be in keeping with more recently built stocks. You will find some further comment on this matter later. Mention will also be made of the next point 'Loss of indicator'. Roll Back Safety Equipment Although I think this is self-explanatory from the bracketed comment, the reasoning may not be familiar. About three years ago there was an instance where a Northern Line train rolled back uncontrolled for quite a considerable distance, and obviously there are safety implications to this scenario. 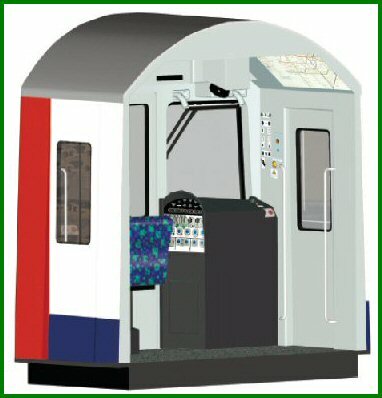 Roll Back protection is to be installed on all London Underground trains to prevent such an occurrence and, for the D Stock, will be done in the context of the refurbishment programme. Connect Radio 'Connect' is an ongoing project which will encompass the whole of London Underground, providing vastly improved communications. This is a real problem on the District line - communications are difficult and exacerbate delays. Benefits to customers though will not only be fewer (or at least shorter) delays but I believe 'Connect' will also mean that mobile phones (though whether on all networks I don't know) can be used in tunnel sections of the system. Whether everyone will see this as a benefit though might be debatable! Car Appearance This refers to the interiors of the cars and is pretty self-explanatory, but see below for the appearance - I've added a collection of photos taken by Ray Bennett which he's taken of the interior of 17008, the one internally refurbished trailer car - my thanks to Ray for these. So, those are the intentions. I mentioned that I would make comment on points I felt valid. These follow. Passenger Emergency Alarms There are several points under this heading which I think are worthy of expansion and explanation. Most are intended to speed the process of getting a train back on the move. 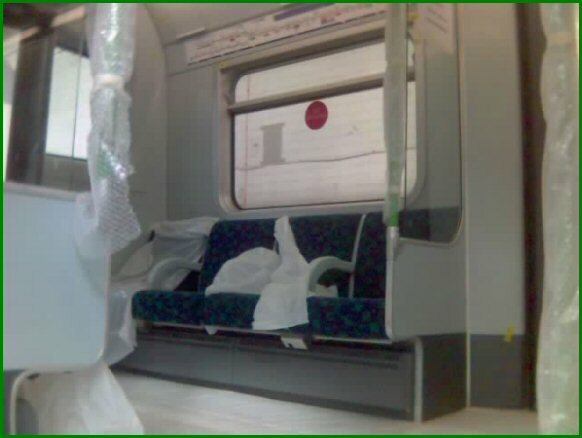 In the event of a PEA being operated the driver is alerted of where on the train the activation has occurred. His actions are to inform the Line Controller and to request the assistance of station staff - remember a driver is on his own. The addition of 'talk back' means that, when an alarm is activated, the driver can immediately acknowledge this and try to get more detail on the nature of the emergency and assess straight away what a) has occurred and b) in the light of this decide on further actions are appropriate and get the necessary assistance he needs to deal with the matter. The point concerning the 'Loss of indicator' I'm afraid leaves me at a bit of a loss! In one of Ray's photos this (I believe) is illustrated. I don't know if there are several of these inside the car - if so it could be that there is one located adjacent to each of the alarm handles and as the handles are to be mounted at low level (see below) it will mean that the activated handle can be more easily identified in a crowded train. I emphasise this is my best guess at the moment, but I will make some enquiries and when I have an answer I'll share it with you! The process of resetting the alarm is also aimed towards station staff too. At present the alarms are reset using the key which activates the train - commonly referred to as an RKL 220 key - and these are not normally issued to station staff. J Door keys are though - they're a square ended key and used for a wide variety of purposes across the Underground. The proposal for 'low level' alarms does concern me a little. While I think it commendable that these are aimed towards the disabled, the reality is that they will also be within the reach of small children! They are brightly coloured and 'just' the right size for small hands - an irresistible combination! I guess that the decision has been taken that 'accidental' activations are a price worth paying. What's not included? Well, from my point of view, I think the only item not mentioned is the lack of inclusion of illumination for the speedometer and air gauges - at the moment these rely on 'luminous' illumination and surely could be electrically lit quite easily - perhaps time will tell! Other than that I can't think of anything else on my 'wish list'. My only other reservation is really around the date of completion of the first train - May 2004 is only five months away as I write this...................... time will tell! 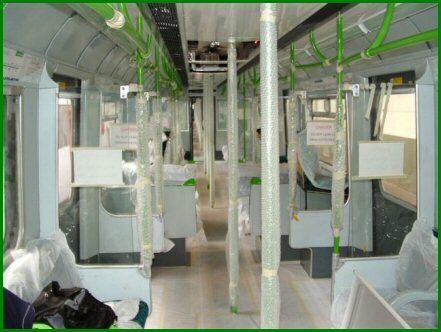 As mentioned above, Ray Bennett has provided the following photos showing interior detail of the existing refurbished trailer car - the captions added (where appropriate) are my comments. I've now received some design sketches of the interior proposals for the refurbishment programme and these are reproduced below with brief captions and explanatory notes added where appropriate. This gives an overall impression of how the interior of the cars will appear. Note that the colour scheme differs from the 'prototype' unit that is in service - I believe that this is correct and not artistic licence. 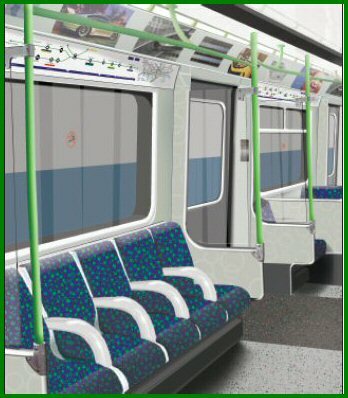 Closer detail reveals the intentions for the colour scheme, seat design and grab rails to be fitted. 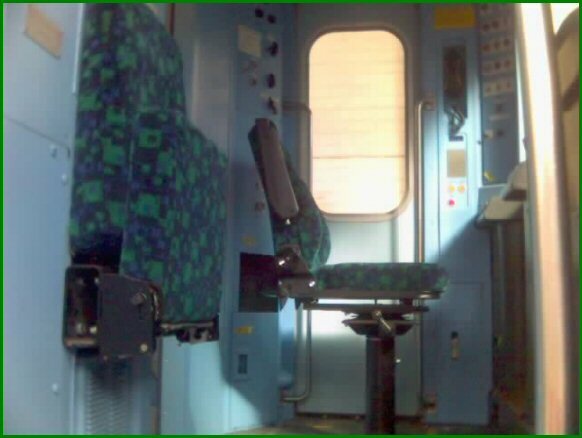 Looking to the driver's side, the additions appear to be the addition of the equipment needed for the dot matrix displays and the addition of a door close button for the offside doors. The other controls appear to be largely unchanged, though revised PA and radio equipment will also be used. The impressions of the rear wall of the cab also show few changes, though there will be a greatly improved Instructor's seat installed - long overdue! 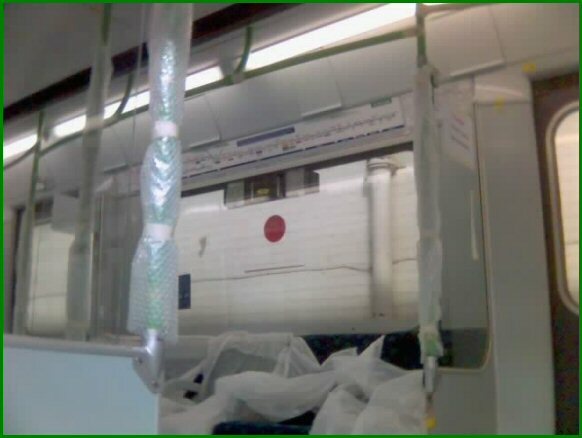 - and the cabs are to have air conditioning installed: the vents for this are visible in the ceiling in the lower image. The final image shows the inter-car door with the dot matrix display installed above it. Firstly I understand that there are still discussions in process about the method of transportation that will be used for the units when the programme gets into full swing - nothing has yet been finally decided it seems as to whether the whole fleet will go by road or whether they will be taken by rail and is so from where and by what route. Similarly the matter of where the units will be commissioned for service on their return is still in discussion too. I also understand that (not unexpectedly) the initial train is unlikely to be returned to London Underground before August, and the earliest it is likely to be 'in traffic' is now likely to be December. This is all to do with matters that are being found during the design finalisation and investigation process that is inevitable in such a project. Another matter that's been thrown into the melting pot is the announcement by Bombardier of restructuring plans that include the closure of the Wakefield plant (see their Press Release) in 2005. According to this release none of the plants affected (which includes Wakefield) has work scheduled for after 2005; are they only referring to 'new build' projects I wonder? More when I hear it! A couple of further items have now been clarified. Firstly, I understand that with the restructuring of Bombardier as mentioned above, the refurbishment programme will indeed be transferred to Derby; this will be the third site to be involved even before the first train is completed. Secondly, as you may know, some D78 stock units (not trains!) have a cab at each end, rather than a Driving Motor Car (DMC) at the 'outer' end and an Uncoupling Driving Motor Car (UNDM) at the 'inner' end. There has been ongoing discussions as to whether all the drivers cabs on these 'double ended' units would be refurbished, but I understand that, for a variety of reasons, the decision has been taken that all cabs on the whole fleet will indeed be updated. The question of the method of transportation to and from London Underground to Derby is still unresolved. I've finally been able to find out the answer to a question which has been posed to me several times - at what rate will the trains be refurbished? I've made some enquiries on this and I understand that the programme shows a train being returned from Bombardier to Metronet approximately every two weeks. Obviously the line needs to keep a full service running, and I further understand that there will be only three trains in work at any one time. The original train (Train 1) is due back in August 2004 and the second train (Train 2) has been sent to Wakefield. It is due back in October 2004. These two trains will then be used for training and testing purposes and it is now confirmed that they are then expected to enter service in December 2004. Train 3 will go to Bombardiers in October 2004, and is due to return in March 2005. Again, it is confirmed that the programme from Train 3 onwards will be refurbished at Derby. The latest is that the first train is now approaching completion and the point has been reached where some of our staff have actually been up to Wakefield to view it; I understand that it's now expected to be returned to us towards the end of next month. I've got some more details about the work that's been done, and as soon as I've had a chance to have an in-depth read through I'll add some further detail. 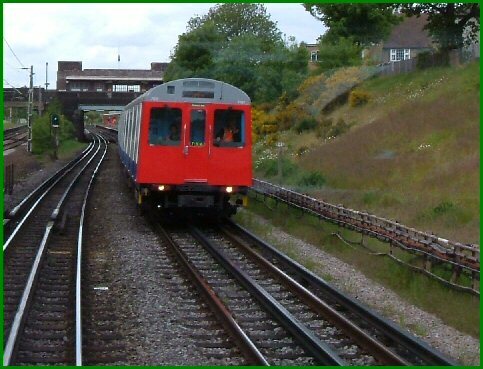 I've heard from a source (outside London Underground) that EWS has been awarded a contract to transfer future trains by rail via West Ruislip. Again more details of this will appear once I have confirmation and more detail. 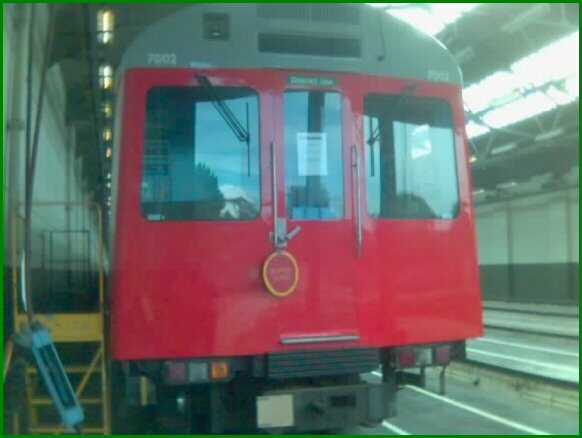 I'm pleased to report that the first train has now returned to London Underground; it arrived at Ealing Common Depot on (I believe) the evening of the 6 October 2004 by road and is now in the process of commissioning prior to use as a training and test train. Although I haven't seen it myself, my understanding is that this is a 'pre-production' version rather than the finished item and will eventually be returned to Bombardier for completion to full traffic standard. 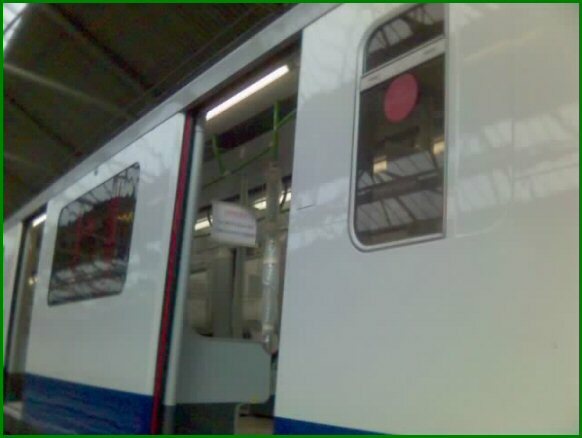 The new colour scheme has been painted, rather than applied by vinyl panels as were used on the trial version. 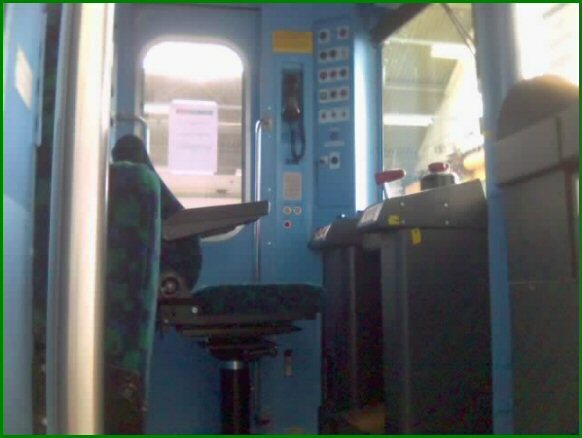 Both the interior and exterior passenger operated door open buttons have been removed - there is obviously no prospect of these being reintroduced into use. The cab colour scheme remains blue - whether this is a 'one off' for this unit, or is how the fleet will remain, remains to be seen. Solidbond went into Ealing Common depot yesterday and has provided me with the photos that follow - which I think give a good overall impression of the 'new' train. Though he took his camera with him, sadly he forgot to put in its memory card, so these were actually taken on the camera on his mobile phone, hence the quality isn't as good as he (or I!) would have liked! However he promises to do better very shortly. I have to rely on him for this as I'm currently away from the line for a few weeks. However, notwithstanding that, my grateful thanks to him for his efforts! Side view giving an impression of the exterior appearance. Note that a blanking plate can just be seen where the Door Open button has been removed. 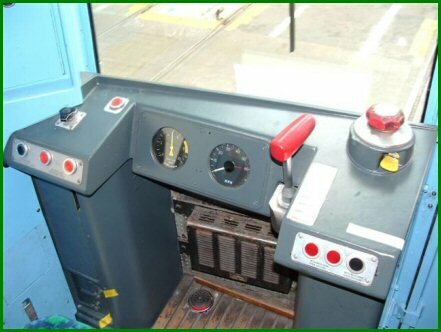 Drivers Cab - note the panel for the 'Passenger Information System' can be seen below the PA handset. 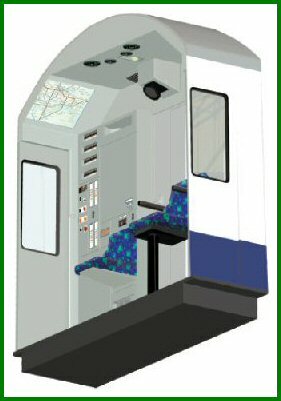 Though not clearly visible, a close button has been added to the door controls, allowing the offside doors to be closed from a seated position. Drivers cab, showing the (hopefully!) improved trainers seat. The tunnel telephone equipment is located behind the backrest and is accessed by lowering this using the ubiquitous London Underground 'J' door key. Some further photos have been passed to me by Chris Cobley of the refurbished train in Ealing Common Depot, not long after it's arrival and give more of an impression of the work carried out. Firstly, Solidbond was chatting recently with the project manager whilst at Upminster recently and he has confirmed that this first train will, ultimately, be returned to Bombardier for upgrading to the final standard of the rest of the fleet. Another interesting development is that (as I mentioned right at the beginning of this section) the preliminary work towards the reinstatement of the old link between the National Rail tracks and Upminster Depot was commenced over the weekend of 30th and 31st October 2004. As will be seen from a gallery of photographs which appear later in this update amply illustrate, the process for transferring trains by road is a time consuming and complex process, so the reinstatement of this rail link certainly seems to make great sense. However, whether this means that the whole fleet will now be transferred from Upminster by this route or whether this is just to add flexibility at this time, I don't know! It is also unclear as to whether this means that West Ruislip is now out of the loop entirely, but with the award of the contract to EWS to haul the trains to Derby (which is confirmed as the site for the refurbishment) certainly suggests that future transfers will be by rail. More on both these topics when information is known! I mentioned above the complexity of the process of transferring a train by road! The following photos taken by Solidbond over a two day period illustrates this very well, and also gives a good impression of just how big a D78 stock car is when seen out of its normal environment! There is a great deal of work which has to be done before each car can be transferred in this way - removal of shoe gear from the motor cars and 'splitting' the unit up by the removal of the semi-permanent couplers which hold the unit together mechanically and the isolation of the air and electrical connections. I now have copies of the various briefing materials on the refurbishment and, once I've had an opportunity to read them in detail, I'll summarise the results of the project here. However, for a quick look at these I know one of my colleagues has been on the briefing course and he's added some comments in my Forum attached to this site. I understand that 'Train 2' - the second set of two units, has now been returned to Ealing Common Depot and that this will, I believe, be the first train to enter passenger service, though I'm prepared to stand corrected on this. Readers here may wish to have a look at the Forum and at some of the comments that have been posted in particular by my good friend and colleague 'Jim'. Certainly he's raised some pertinent points, particularly about the seeming lack (still!) of illumination for the cab gauges - this really does seem like a missed opportunity to correct a shortcoming. The only thing I wonder is whether this is just something not included in the 'trial' unit. I hope so! The first train has however been out on the test track at South Ealing and the ever enterprising Chris Cobley's been out with his camera and provided the following photos. If you are unfamiliar with the area, the 'local' line is equipped with various equipment to allow its use as a test track. 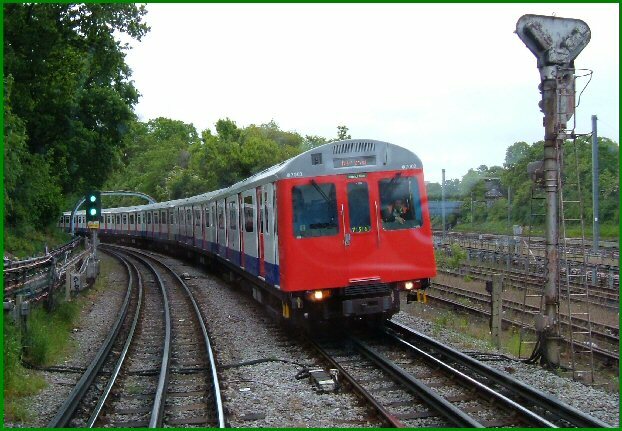 It's proximity to Ealing Common Depot is the reason why most stocks of London Underground rolling stock are seen in Ealing Common Depot from time to time, mainly for brake performance testing. When in use as a test track the line is closed to normal traffic by means of a 'possession' and the section of track becomes bi-directional. The trains themselves are then operated by dedicated Test Train crews. To add a little flesh to the bones of the 'Stop Press' announcement on the front page, a Timetable Notice has been issued allocating running 'slots' for the refurbished train to be out and about on the main lines. I understand that the train will be numbered 756. It covers Tuesdays to Fridays inclusive for the period from 12th January 2005 to 28th January 2005 and covers all the routes and reversing points that D Stock trains routinely use. However this doesn't necessarily mean that it will be out every day, or that all the moves will be carried out as included in the Notice. For example, I can confirm that on the 12th January it had been moved within Ealing Common depot, though I do not think it has actually yet ventured outside the confines of the depot. I am not going to go into details here of the paths allocated as this is of course 'internal information', nor do I want to be inundated with e-mails saying 'you said it was going to be at such-and-such a place at such-and-such a time'! All I can suggest is that if you do want to have an advance view of the train it's worth keeping your eyes open over the next few weeks! The only information I feel I can reasonably confirm is that all the moves are scheduled between about 10:15hrs to 15:00hrs - I leave you to make your own judgements within these parameters. Well, so much for that last update! So far as I've been able to ascertain the train has still not ventured out of Ealing Common Depot - I have certainly seen it stabled stubbornly on 3 Road in the depot throughout this period and all my duties have encompassed at least part of the timings and I didn't see it 'out and about'! I can only presume commissioning work continues. As and when I hear of further dates being proposed for its testing I will publish them here. However, one thing I did make mention of right at the beginning of this page that is indeed coming to pass is the reinstatement of the pointwork from Upminster depot to connect to the National Rail network via Platform 6 at Upminster. The work is under way, and I was able to get the following photo of progress to date during the last week. You will note that the points are in place, the track bed is being laid and the track panels seem to be ready for installation. The old 'buffers' from the sand drag at the end of 51 Road are visible in front of the signal cabin just to the left of the walkway. Well, it's finally happened - 'Train 2' ventured out on the mainline today! I'd not long got home this afternoon when our Line Standards Manager phoned me to let me know that it was indeed finally making its way from Ealing Common to Upminster, so it seems we're now a step further towards the Great Day when it enters traffic, though this is still a little way off, of course. Unfortunately, there was no chance of me chasing it across London for a photo opportunity - it would probably have been safely ensconced in Upminster depot by the time I'd got even half way there! So, the proving runs are underway. Keep your eyes and cameras peeled! The Great Day finally approaches! At last, it seems that the two refurbished trains completed to date will enter passenger service. 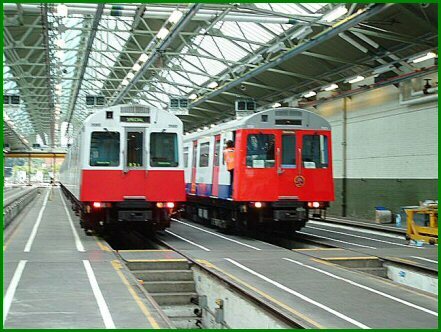 I understand that both trains will be used to form the Olympia service from Start of Traffic on Wednesday 27th April 2005. Further, I believe that this will continue to be the pattern for some time, the idea being that it should maximise the opportunity for as many Train operators as possible to experience and become familiarised with them, whilst keeping them close to the services of technical staff. As both trains are currently at Ealing Common depot, I believe that on the morning of Wednesday 28th April, they will enter service as train 151 (ex Ealing Common depot w/b 06:30) and (I believe) train 127 (ex Ealing Common depot e/b 06:32). The latter train will be reformed (renumbered) to 152 at approximately 10:30 and will then continue in service as this. Train 151 will stable at Ealing Common depot at approximately 00:42, and 152 at Upminster depot at approximately 00:58. I emphasise that these are the plans as they stand at the time of writing; of course circumstances may force changes, and I give no guarantee that this will all come to pass! However, I know that a number of plans are being formulated to ensure that the trains do run without problems (at least from the train crew point of view), but if I become aware of changes I will publish them here. As you have probably have read if you are a follower of the Forum attached to this site, the event did not occur. Since then, there have been another couple of dates put forward when it was intended the two refurbished trains would enter service, but these did not turn out to happen either. Despite extensive enquiries I've yet to find out either when the launch will happen or indeed exactly what the delay is due to; I have heard some rumours on this, but as they are only speculation I am not going to elaborate here. But rest assured as soon as I have some accurate information I will put the details up. In the meantime, I understand that 'Train 3' is progressing in works at Derby, and I've been told that it will return to London Underground in the second half of June. The fourth train has now departed from Ealing Common to Derby, again by road. So, we now effectively have a shortage on the fleet of four trains, and this, when taken in context with normal maintenance and other ongoing modification programmes that are ongoing, is now starting to result in trains being cancelled because of shortages of rolling stock. I have little doubt that Metronet and Bombardier are under some considerable pressure to get the delays resolved as quickly as possible! 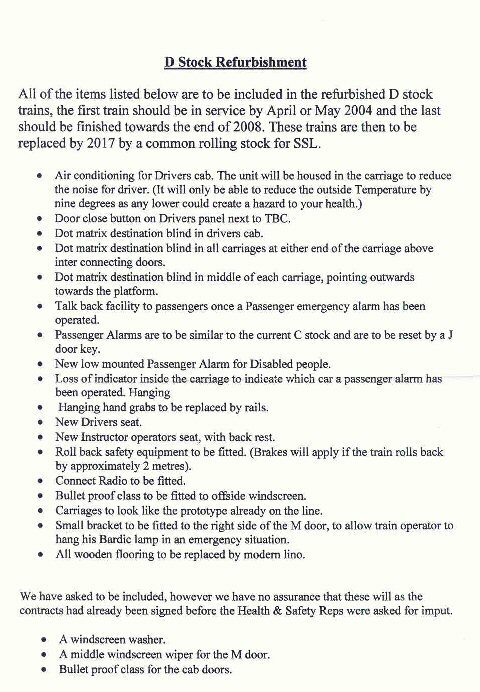 I understand that the programme has now been 'signed off' by HMRI and that the first two refurbished trains will enter service tomorrow, 1st June 2005. One will form train 152 (ex Upminster 07:59, to Ealing Broadway departing 09:44 to High Street Kensington and then on the Olympia route until it's 23:37 departure for Upminster) and the other will form train 151 (ex Ealing Common 06:32, departs Ealing Broadway 06:43 to High Street Kensington and then on the Olympia route until it's 00:05 departure to Ealing Broadway). Again it is emphasised that these are the plans as they appear to stand as I write this. Thanks to Solidbond for keeping me informed whilst I'm on leave! Further to yesterday's update, the trains did not, in the end, come into service. My understanding is that, although the work has been 'signed off' the formal documentation has not yet been received. The plan for them to enter service today was, I presume, based on the expectation that the paperwork would have been received in time. So again a false start! As soon as I know more it will be posted. In the meantime, just to keep your interest, a couple of photos of Train 1 which I managed to grab whilst it was out on the 'main' during mid-May 2005. Train 1 seen departing Hornchurch eastbound. 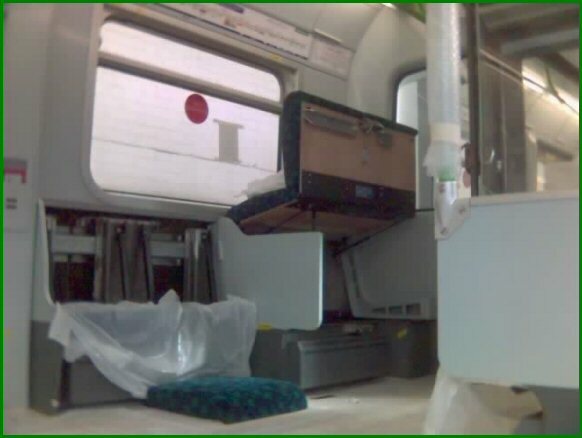 Train 3, whose departure is illustrated above in Solidbond's photos, has now returned by road to Ealing Common Depot and I believe is currently undergoing commissioning prior to testing.